In a recent article in Observer Magazine, Eva Wiseman really got me thinking about how much I hate this 'hey girls, you're all beautiful' sentiment that seems to have suddenly sprung up out of nowhere. Well, probably not out of nowhere. I'm fairly sure it's a response to a lot of issues surrounding how women are presented in the media, the 'size zero models' debate, the rise of eating disorders in young girls, etc etc etc. It sounds like a nice thing to say, a little confidence boost to all those insecure women and girls out there, but it has always left me feeling a bit cynical. 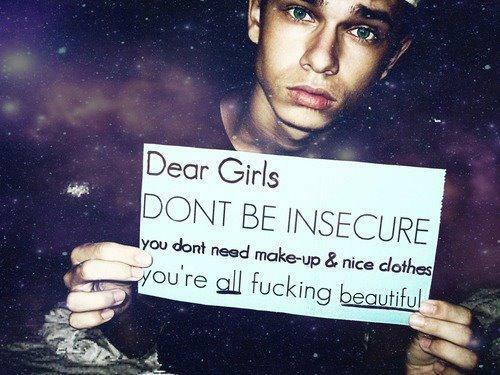 The thing is, when we tell an insecure teenage girl "Don't worry, you're beautiful! ", we are still enforcing the message that being attractive - having somebody, a boy, find you attractive - is more important than anything else. Why is 'beautiful' the default compliment? Why can't it be something that doesn't (whether we mean it to or not) imply that we have a responsibility to look attractive for other people? When I'm feeling unhappy about the way I look, the last thing I want to hear is "You're beautiful" because I don't believe it myself. It just sounds empty and false. Wow, I didn't realise it was that simple! Thanks, skinny teenage girl! How about we start telling people that they are 'wonderful', or 'strong' or 'loved' or 'inspiring' or anything that compliments the person inside, and lets them know that we are really listening to them? 'Beautiful' is a brush-off. It's a low-effort way of getting somebody to shut up about their insecurities. It's also a low-effort way for boys to make themselves seem like sensitive little feminist allies. Just hold up a sign, make a simpering face, photoshop yourself onto a space background, and you're suddenly A Totally Progressive And Nice Guy. The funny thing is, you just know that the kind of guys who say this are the same ones who would make gross comments about fat girls, and hairy girls, and girls who choose not to wear make-up and 'nice clothes'. The thing that gets me about that particular message is the word 'need', as if make-up and nice clothes are exclusively used to cover up our flaws, rather than to highlight our best features. I wear 'nice' tops and dresses that show off my shoulders and the shape of my collar bones. I wear eyeliner and mascara to draw attention to my big brown eyes. I'm sure everyone has similar features that they dress to highlight rather than to cover up. Hell, sometimes I just wear an item of clothing because I like the design. And yes, of course some types of make-up and clothing do cover up the bits we're not so happy about. I have dark shadows under my eyes and I feel and look a lot more alert and put-together when I use a dot of concealer to cover them up. I'm not going to stop doing that just because some angsty teenage boy is 'concerned' about my perceived insecurities. I think if it was more socially acceptable for men to use make-up, then a lot of them would use concealer and powder because it is nice to be able to cover up blemishes and stop your face looking so shiny. My boyfriend has even borrowed my concealer in the past when he's had a bad skin day, and he is the most confident person I have ever met. When men tell women that they shouldn't wear make-up or dress in a certain way, they seem to think they are being progressive and freeing us from the shackles of oppression. But what they are really doing is giving us yet another beauty standard to live up to, one that is even more difficult than the one they are trying to save us from. Now, instead of women being expected to make themselves look beautiful by using make-up, fashionable clothes, spray tan, hair dye, high heels, etc; we are expected to look flawless without these things! This brilliant article explains it far better than I can, but the gist of it is that when men claim that they prefer women who don't wear make-up, they don't mean that they think women look better with shiny skin and tired-looking eyes, they mean that they want a woman who is already flawless. In conclusion, stop trying to 'help' solve body image problems by enforcing even stricter standards! Stop teaching young girls that the most important thing about them is their beauty, as opposed to their brains, their strength and their kindness! 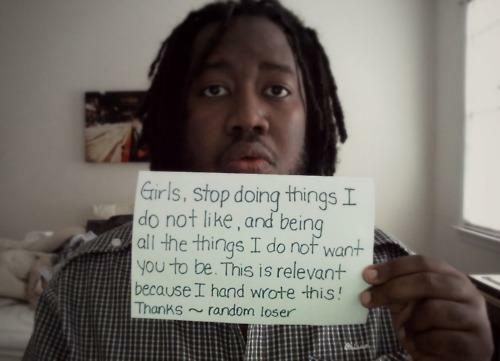 And for the love of God, stop looking forlorn and posing with handwritten signs, you look ridiculous. Except this guy, he has the right idea.